The following details the correct sitting positions for the driver and passengers. If any vehicle occupants cannot assume a correct sitting position due to their physical build, they should contact a qualified workshop to find out about possible special modifications. 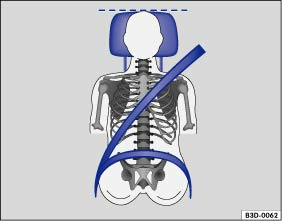 The seat belts and airbags can only provide a maximum level of protection if a correct sitting position is assumed. Volkswagen recommends using a Volkswagen dealership for this purpose. Adjust the head restraint so that its upper edge is at the same height as the top of the head, but not lower than eye level. Position the back of your head as close to the head restraint as possible and . When adjusting for short people, push the head restraint all the way down, even if the head is then located underneath the top edge of the head restraint. For taller people, push the head restraint up as far as it will go. Keep both feet in the footwell while the vehicle is in motion. Adjust and fasten seat belts properly . Move the backrest into an upright position so that your back rests fully against it. 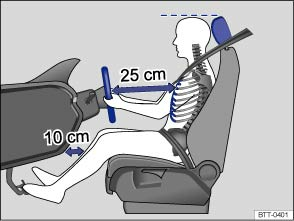 Adjust the steering wheel so that the distance between the steering wheel and your breastbone is at least 25 cm and the circumference of the steering wheel can be held at the sides with the arms slightly bent. The steering wheel must always point towards the breastbone and not towards the face. Adjust the driver seat by moving it forwards or backwards so that you are able to press the pedals to the floor with your knees still slightly angled and the distance to the dash panel in the knee area is at least 10 cm . Adjust the height so that you can reach the highest point of the steering wheel. Always leave both feet in the footwell, to help ensure you maintain control of the vehicle at all times. Push the front passenger seat as far back as possible so that the airbag can provide maximum protection if it is triggered.